The comfortable 3 star hotel located in the heart of Manado city with modern and stylist architecture design. Just 2 minutes to Manado town Square Mall and to the central business distric. Provides 154 air conditioned rooms, sleep soundly with sweet bed by ibis and complimentary WIFI, 24 hours open kitchen restaurant, Bar and 3 modern meeting rooms, the hotel is perfectly located for your leisure and business purposes. 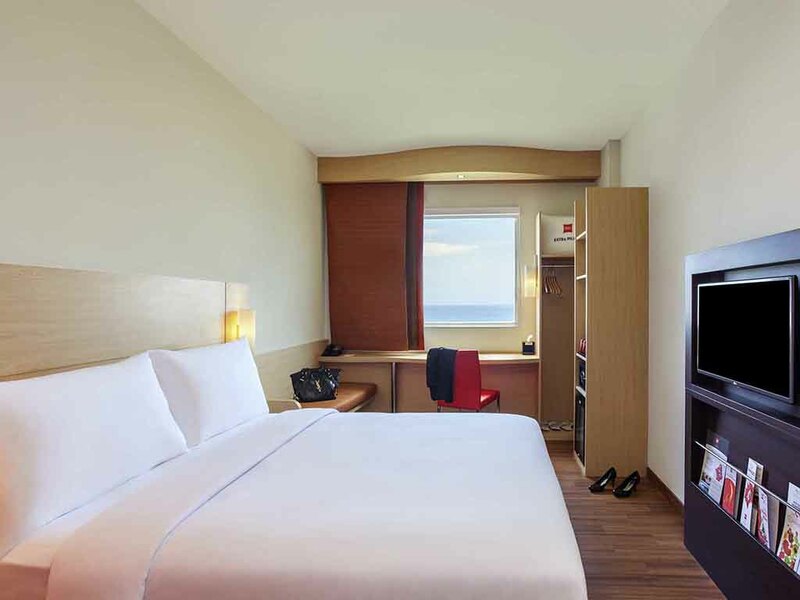 ibis Manado City Center Boulevard is located in the heart of Manado city. Shopping center and entertainments only in walking distance. The beautifull underwater of Bunaken can be accessed easily (5 minutes from hotel to the port). The contemporary room features a double bed or 2 single beds, 32 inch LCD TV screen, safe deposit box, mini bar, hairdryer, free WiFi, tea and coffee and either mountain or sea views. The restaurant serves a wide spread of delicious international cuisine and authentic Manadonese delicacies. Located at the ibis Kitchen restaurant, The Lounge serves delectable alcoholic and non-alcoholic beverages. The staff was friendly, welcoming and helpful. They have a delicious breakfast buffet, and their restraurant has good food for a good price. Wifi worked well in the room. The A/C was cool, not cold. I was on the 9th floor with a nice view, but in the morning the water in the shower was barely warm, not hot. The Ibis is conveniently located across from the Mantos Mall and Hypermart. I will definitely stay here again the next I'm in Manado. It was very nice to have stayed at Ibis Manado. I really enjoyed all the services, hospitality, the room, and the foods. That was incredible. Thanks also to Ms. Vella for being helpful in assissting me during my stay. Looking forward to visiting this place some other times. I will back in Manado and stay this hotel. Was very nice. the staff is friendly and very helpful when I need some help. my bedroom was always nice and clean. perfect location and easy access to anywhere I want it to go. great experience to stay in ibis hotel boulevard manado. Very polite & helpful staff ..
As an Accor Plus Platinum member I receive very good service from the staff. Thank you. The towels have stain, the floor mat is too old. The bed sheet have stain as well. The sound prove of the window need to be improved as well. The whole night I keep hearing the sound of the motor. But, the view from my room is very nice.